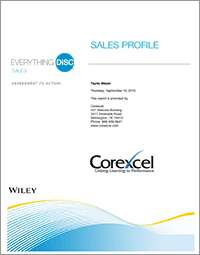 The Everything DiSC Sales Profile is a research-validated online DiSC-based profile that generates a sales-specific 23-page report. Respondents answer the survey items and are prompted to "people-read" a customer. The result is DiSC Profile report with a personalized Customer Interaction Map embedded. The Everything DiSC Facilitator Report is a group report using data from Everything DiSC Application Library individual reports. If you have a group of participants who have completed the Everything DiSC Sales, Management, or Workplace profiles, you can view a summary of all their DiSC styles and see how they relate to each other. 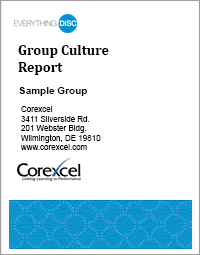 The report provides an overview of your group's culture and offers issues to consider in order to work together more effectively. The Everything DiSC Facilitator Report includes the names and styles of each participant and can be used across all Everything DiSC Application Library programs. The Everything DiSC Group Culture Report provides a composite of your group's DiSC styles. If you have a group of participants who have completed the Everything DiSC Sales, Management, or Workplace profiles, you can view a summary on the DiSC styles found in your group and and how they impact your organization's culture. The report allows you to easily determine a group's DiSC culture and explore its advantages and disadvantages. The DiSC Culture report does not include participant names. 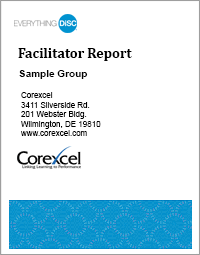 Request a Corexcel facilitator using our Everything DiSC Training Request Form or do it yourself using our turn-key facilitation materials below. 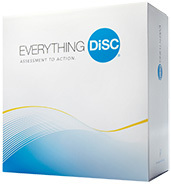 The Everything DiSC Sales program consists of six 50-minute modules. It includes a fully scripted program which contains engaging experiential and processing activities. Easily add, subtract, or rearrange materials to create unique presentations and reports for virtually every situation and any time frame. Offer courses ranging from one-hour to a full-day. The facilitation materials contain more than 60 minutes of real-world, sales-specific customer interaction videos integrated with the PowerPoint. Everything DiSC Sales Customer Interaction Guides are used to support your DiSC selling and sales training sessions. These are job aids that feature the Everything DiSC Sales Map and tips for selling to each of the behavioral styles. Use these maps to figure out a client's style or as a refresher before a big sales call. They fit perfectly into your wallet, day planner or briefcase. If the video player does not appear in your browser please click a title below to view the video. 9:00 - Introduction to the DiSC model in sales situations. 0:44 - Short clip from the facilitator's kit showing two people talking about the role of sincerity in the selling process. 1:23 - An example of a customer with a "D" style. See what appeals to them and their priorities in the selling process. 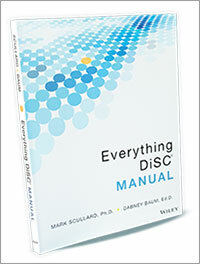 The Everything DiSC Manual is the newest release in the Everything DiSC catalog of profiles and training resources. This book contains recently published research and theory reports that were used in the development of Everything DiSC assessments. The manual will explain profile administration, reliability, demographic considerations, and interpretation. This comprehensive guide is a great support tool for consultants or any trainer or facilitator using Everything DiSC. "DiSC" and "Everything DiSC" are registered trademarks of John Wiley & Sons, Inc.